Ever seen those professional divers perform those complex moves? Now you can do it on your mobile: with your fingers you can do backflips, front flips, twists and other moves, as Flip Diving from Miniclip.com is a bona fide diving game. But make sure you don’t hit one of those rocks when you jump off a cliff. Flip Diving has a proprietary physics engine, but rest assured that it isn’t as difficult as you might think. This is a casual arcade game at heart and you can control your character with one finger. As the diver stands on a high platform or cliff, use your finger to push at the screen. Let go of your finger and he will jump. To a do a complex dive, push your finger again and then raise your finger up to take a smooth dive. The key is to dive with your feet going down first, and it might take a few dives before you get the hang of it. Every stage in Flip Diving has several areas where you can dive off from. You need to go dive from all the points, and once you do you will notice your landing area’s size shrink. This is only one challenge as you also have to make sure you don’t hit an object when you dive, and you have to land the right way. 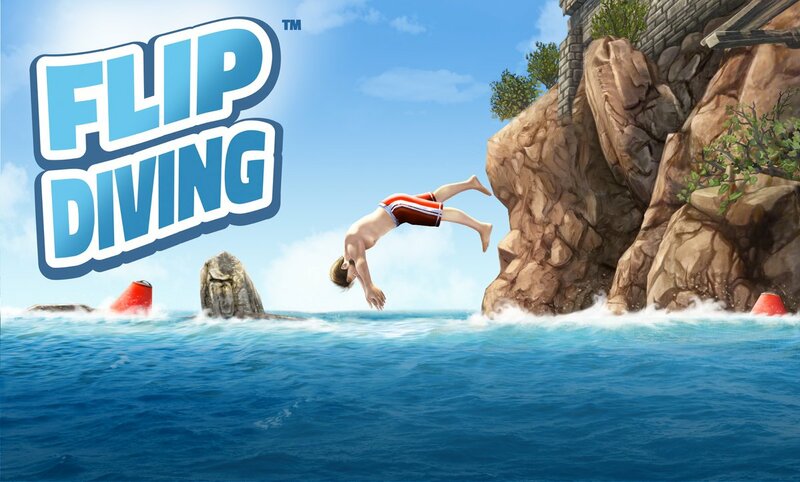 Flip Diving also has plenty of coins you can gather to purchase a Gacha machine, and this gives you the chance to uncover new tricks, open new levels and get new divers. All in all, it’s a cool game.